New version of Digilog Samulnori created by Korean maestros Duk-Soo Kim, Sook-Sun An and Soo-Ho Kook, overwhelmed the audience at the opening ceremony of 2010 UNESCO world conference. 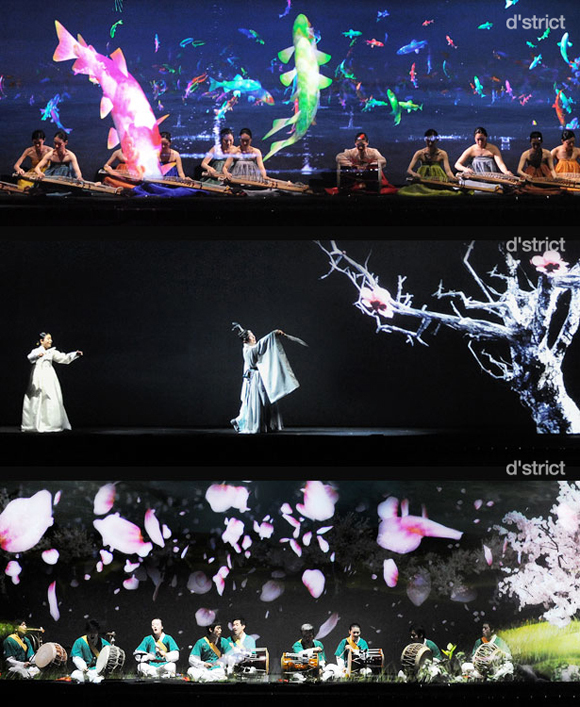 VIPs from all over the world praised highly on this Digilog performance renewed and given a new name "Seoul Rainbow – For 2010 colored flower, bird and fish", as a beautiful combination of extremely realistic hologram and live performance of renowned traditional artists. The sold-out performance Digilog Samulnori in January has proved 4D performance's potential and the audience's craving for this new field. 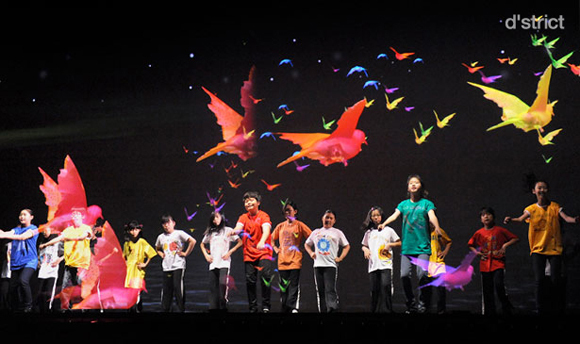 Four months after the first show, the long-expected second performance opened the UNESCO world conference on May 25th. 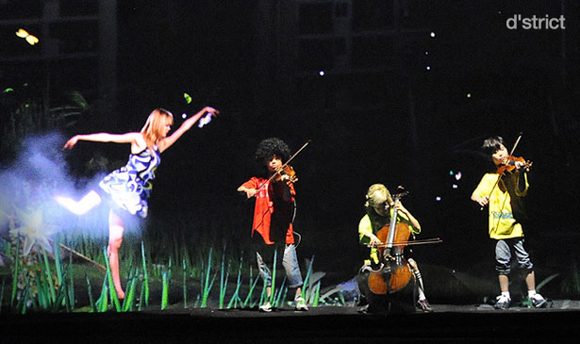 Sir O-Young Lee, who directed and wrote the scenario, performance director Jae-soon Pyo, Pansori artist Sook-Sun An, Samulnori artist Duk-Soo Kim, traditional dancer Soo-Ho Kook, In Nam soon, modern dancer Yook Wan soon, and fashion designer Young-Hee Lee collaborated to create even greater show. The show introduced the excellence of Korean culture and the advanced digital technology of Korea, the IT powerhouse, to international leaders in culture and education. The second UNESCO World Conference on Art Education following the successful first conference in Lisbon, 2006, is an international assembly for enhancing and advocating the importance of arts education hosted in Asia for the first time. It was a moment to acknowledge that the synergy of Korean traditional arts and the cutting-edge technology including the interaction technology that actively communicates with the audience, not to mention the state-of-art hologram, transformed 4D Digilog art into a new genre. 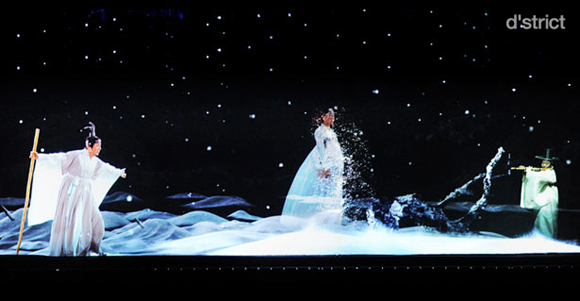 This groundbreaking performance, also broadcasted live by KBS, impressed many international participants, and contributed to the promotion of Korean culture for the global community. Live hologram that actually works with the performer and real-time interaction technology that displays various vivid images according to the performer's sound and movement have become d'strict's most distinctive characteristics. Gesture & Sound sensing technology introduced last June at the new product's launching presentation is under continuous development; this human-friendly technology is now a backbone of the 4D performance. 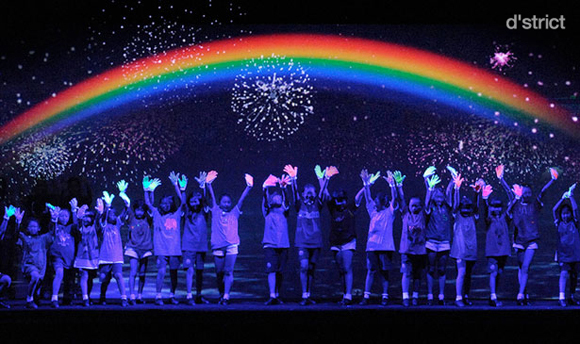 On the stage, the performers and the graphic images harmonized perfectly; butterflies danced to the sound of violins, and alphabets rose from children's toes while they're tap dancing like splashing water. 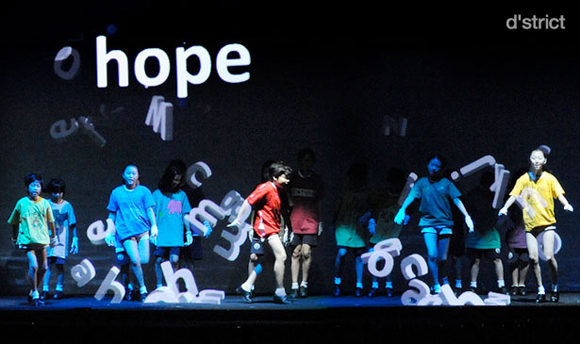 The rising 4D performing arts field started with Digilog Samulnori will continue to evolve. 김덕수, 안숙선, 국수호 등 한국 전통 문화계의 거장들과 함께 했던 디지로그 사물놀이 '죽은 나무 꽃피우기'의 새로운 버전이 2010 유네스코 세계 문화예술교육대회 개막식 공연을 장식했습니다. <4D 디지로그 아트 공연 '서울 무지개-2010 색깔의 꽃 과 새 그리고 물고리를 위하여'>라는 이름으로 재탄생한 이번 4D 디지로그 공연은 현실감 넘치는 홀로그래픽 영상과 최고의 전통 예술가들의 퍼포먼스가 결합되어 세계 각국의 귀빈들로부터 뜨거운 반응을 불러일으켰습니다. 지난 1월 세계 최초의 4D 예술 공연인 '디지로그 사물놀이 - 죽은 나무 꽃피우기'의 전회 매진 후, 새로운 공연 장르인 4D 공연의 가능성과 관객들의 목마름을 확인 할 수 있었습니다. 처음으로 시도되었던 실험적인 무대였던 만큼 아쉬움도 많았기에, 일찌감치 좀 더 발전된 형태의 두번째 공연이 예고되었고, 첫 4D 공연 후 4개월만인 지난 5월 25일, 제 2회 유네스코 세계문화예술교육대회의 개막식 무대에서 선보였습니다. 총감독과 시나리오에 이어령 선생님, 연출에 표재순, 판소리에 무형문화재 안숙선, 사물놀이의 김덕수, 전통무용의 대가 국수호와 인남순, 현대무용의 육완순, 그리고 세계적인 패션 디자이너 이영희 선생님 등, 국내의 내노라하는 문화예술계 거장들이 다시 한자리에 모여 보다 크고 화려한 무대를 창조하였습니다. 이번 공연을 통해 우리 문화의 우수성과 독창성 뿐만 아니라 IT강국의 4D 디지털 기술을 세계 문화예술 및 교육계 인사들에게 널리 알릴 수 있었습니다. 제1회 포르투칼 대회에 이어 아시아에서 처음으로 열리는 유네스코의 세계문화예술교육대회는 문화예술 교육의 가치를 향상하고 강화하기 위해 전세계의 관련 인사들이 모여 다양한 세미나와 부대 행사를 갖는 학술대회입니다. 4년에 한번씩 열리는 이번 대회에서 문화예술 강국, 한국의 전통 예술이 관객과 소통하는 인터랙션 기술과 최첨단 홀로그래픽 영상 기술을 만나 새로운 장르로 탄생한 4D 디지로그 아트의 공연을 선보여 더욱 뜻깊은 자리가 되었습니다. KBS를 통해 중계방송되기도 한 이번 공연은 세계의 문화 예술계 석학 및 관계자들에게 큰 감동을 선사하여 우리나라의 문화 공연 예술 분야의 우수성을 세계에 널리 알리는데 일조하였습니다. 실감나는 홀로그래픽 영상이 실제 무대위의 공연자와 함께 호흡을 맞추고, 공연자의 움직임과 소리에 반응하여 마치 살아 숨쉬듯 각기 다른 비주얼을 보여주는 실시간 인터랙션 기술은 이제 디스트릭트의 가장 큰 특징이 되었습니다. 작년 6월 처음으로 신제품 프리젠테이션 무대에서 선보였던 제스처 센싱과 사운드 센싱은 계속해서 발전하고 있고, 이것이 공연 예술과 접목되어 단순한 기계의 반응이 아닌, 마치 주인공 처럼 4D 공연에서 가장 큰 역할을 담당하게 되었습니다. 이번 공연에서는 바이올린 소리에 맞추어 나비가 날아가고, 어린이들의 탭댄스에 반응하여 발 끝에서 알파벳이 올라오는 등 무대위 퍼포머와 그래픽이 완벽하게 어우러져 보다 깊은 감동을 선사하였습니다. 디지로그 사물놀이로 시작한 우리 전통 예술과 홀로그래픽 영상 및 인터랙션 컨텐츠 등의 디지털 기술이 접목된 4D 예술 공연은 앞으로도 더욱 발전하며 계속 이어질 것입니다.